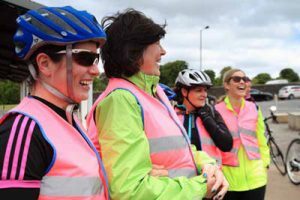 As part of our aims to support women’s physical and emotional health and well-being, Derry Well Women developed a return to cycling project in 2010. The aim of the project is to support women who wish to maintain or improve their health by returning to cycling, and to promote cycling as a physical and fun group activity. Derry Well Women can provide National Level 1 and 2 cycle training to any women wishing to get on her bike again. We provide bicycles and safety helmets. Women who own their own bicycles are also welcome to join. Monica Downey, our creche coordinator, is also our cycling instructor and she gently guides women through Levels 1 and 2, and through a cycling group which supports women to keep on cycling and exploring the cycle paths within the city. We are happy to work alongside Sustrans ( www.sustrans.org.uk ) in the development of this project.